Plot – Working class Asian/American Rachel (Wu) must learn to come to terms with her boyfriend Nick’s (Golding) high standard in Singaporean society after she finds out he is heir to the throne of one of countries richest businesses while attending one of his lavish family weddings. It may not mess with the well-trodden, tried and true romcom formula but thanks to its colorful culture and insight into a society many of us have likely not much knowledge of, Crazy Rich Asians is a winning crowd pleaser with a great big beating heart and enough laughs to ensure it’s likely to remain 2018’s most popular date movie. 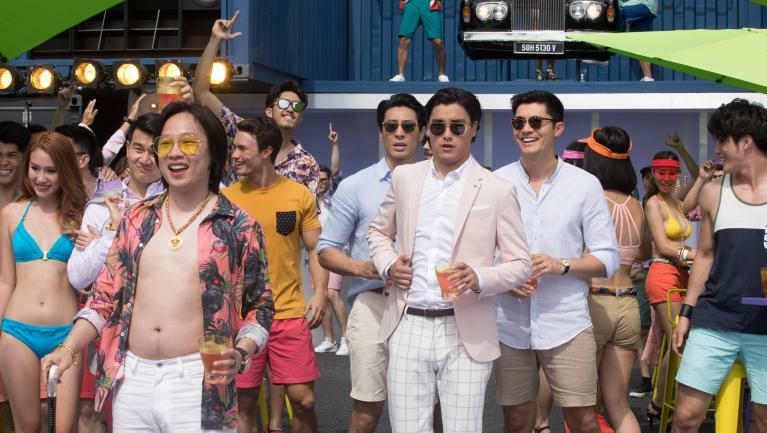 Based on Kevin Kwan’s best-selling novel of the same name, John M. Chu’s energetic film is one of the rare times Hollywood has delivered a tent-pole picture with an almost entirely Asian cast and with a majority of the films proceedings taking place is the oft overlooked country of Singapore, Crazy Rich Asians feels like exactly the right type of romcom for an industry looking to showcase itself as much more than a ‘white’s only’ landscape. In many ways as important as Marvel’s Black Panther was in the early parts of the year, Chu’s film is a great example of transporting a story that at its core is rather cookie cutter into a fresh and exciting world that in turn makes the familiar narrative beats stand out much more than they had any right to do. Following the fish out of water story of Constance Wu’s working class Asian/American economics professor Rachel Chu and her relationship with Henry Golding’s filthy rich Asian property tycoon heir Nick Young, as the two look to win over Nick’s family in his homeland of Singapore, Chu strikes an engaging balance between examining this luxurious high society, old school traditions and the growing relationship between Rachel and Nick. Played enthusiastically by relative newcomers Wu and Golding, Rachel and Nick are the type of too good to be real movie lovers but that doesn’t stop us from getting on board with their plight to overcome the odds and learn to live as one as Chu throws them into various scenarios and situations that will bring viewers a range of emotions from well-earned laughs through to equally earnt tears, all done in a way that will be loved by its target audience and more than tolerable for those dragged along by their other halves. If there was an anchor to how far Crazy Rich Asians can take its fresh approach to age old material it’s in the fact that it never takes any chances to surprise the audience as is the case the romcom genre, things will often play out exactly as you would expect for a film of this ilk, making Chu’s feature an enjoyable but far from different experience outside of its cultural grounding. Filmed with an energy and vibrancy that brings its settings and characters to life in a loveable way, Crazy Rich Asians is a winning cinematic outing that will see more Hollywood players scrambling to unleash more Asia infused outings into the marketplace, in hope they too can capture some similar crowd pleasing magic. I personally loved this movie. Was fairly predictable, but it was done in a right way and produced a classic romantic comedy feature for the modern era. Agreed mate, I just think its a heck of a lot of fun and can be enjoyed by a wide range of ages and backgrounds. Not so sure the sequels will be to good but at least we had this event!